I awoke Thursday morning to find one of my two greatest inspirations, Sir pTerry Pratchett OBE, had died. It was not a good feeling. It was hard to explain exactly how this made me feel, but for those of us geeks that looked beyond the emotive veneer of modern civilization to address the underlying thoughts the past month has been hard. Not only have we lost the intellectual voice that was Pratchett, but less than 2 weeks ago we lost the ‘face’ in Leonard Nimoy. However while Nimoy was a great figure, in many respects he was far less important than Pratchett, he conveyed an image, portrayed a character created and written by others. Pratchett on the other hand, was the creator, the thought provoker, and mind who not only created the thoughts but gave them a vehicle to speak through. Or the difference between politics and fact as explained by Mr Bent. “What We Did On our Holidays: What I did On my holidys I staid with grandad he has a big White hors and a garden it is al Black. We had Eg and chips. Of course many seem to focus entirely on the Discworld, and not his other works. That’s why I was particularly gratified to see XKCD honour him with an illustrated quote from the Bromeliad trilogy, and one that encapsulates not only his way of looking at the world, but of XKCD’s position too; that of looking outside our own world, to see the wider world around us which may shatter our preconceptions. For me, I loved all his works, not just the Discworld, but also his early, lesser-known ones, like Strata, or Dark Side of the Sun, and his most recent trilogy, the Long World books (which are not only incredibly good sci-fi on their own, but even reference my other inspiration in Long Mars, Kim Stanley Robinson and his Mars Trilogy). My first experience of the Discworld series goes back to the early 90s, when a friend did posters for Spanish class on both Death, and The Luggage. It prodded my curiosity over time, until I started reading one or two at the library. The first one I owned was Hogfather, for Christmas 1996. At that point I was hooked. 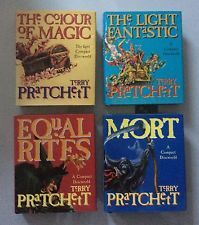 At one point I had all discworld books, including the first four in a pocket (or ‘compact’) edition barely bigger than a box of matches, as well as getting new ones on the day of release. It’s a habit we picked up some ten years ago, as I read Monstrous Regiment aloud to us when it first came out, but I found it hard as I have a tendency to ‘read’ faster than I talk (according to some, that’s saying something! ), but it tends to make me very sleepy. So struggling though, we one day came across the audiobook version – the rest is history. We have every book (unabridged) and play them mostly in order (Eric and Last Hero combined match the length of the others, and we tend to put the Tiffany books together), a new book a night. This also includes the radio plays, along with the two other ‘greats’ of British SFF – Rowling’s potter books and the radioplays of HHGTTG. And when we reach the end of the list, it’s back to the start. As such, every discworld book is ‘experienced’ at least four times a year, for the last 10 years; not many can make that claim. We also have other traditions too, such as watching the TV movie of Hogfather every Christmas as a family, and at Halloween, all the skellington’s wear black robes, have blue eyes, and carry scythes. It’s also become a tradition that the one panel I go to with the wife at Dragoncon each year is the Pratchett panel, although it’s gone from us both in the audience in 2012, to both on the panel in 2014. But why has it become a tradition? It’s because things are so fresh, and there’s such an interlocking interplay of words and wisdom, that you can still pick up things after a dozen or two times you’ve missed previously. They’re also staggeringly well researched, with so many little references and in-jokes that an annotated file was needed. Many books also contain a deeper commentary, from sport (and fashion) as a religion in Unseen Academicals, to the ease a populace can be whipped up to support a war in the appropriately named Jingo. Some often have multiple messages, hidden from casual observances, which takes work. For instance, while many would happily state Equal Rights is, as the name suggests, primarally about sexual equality, it could also be looked at in terms of Granny Weatherwax, as a story of not constraining others by your own preconceptions and limitations, especially those you’re teaching. Each time Granny sets Esk to a task she things is appropriate, Esk shows she’s capable of more, and she’s better at that more. Going Postal, on the other hand has a subtext on how bad monopoly control of communication infrastructure can be, which had become somewhat of a reality in the US requiring the FCC to provide Net Neutrality rules. Of course, it’s the major subtexts that are the most important, and influential, and which British Literature will miss the most. The ‘what does Christmas mean’ of HogFather, Soul Music’s rock and roll, or the realities of journalism and The Truth. It’s the societal commentaries that will enlighten people centuries from now, and go down as one of the great authors in history. Now, alas, pTerry has passed, and on top of condolences to his entire family, from mine, I add a small plea – please, Rhianna, ensure that in your position of Guardian that you do indeed Guard. Nothing tarnishes something great, than a cheap and tawdry attempt to cash in. The new series “The Watch” (aka “CSI: Anhk Morpork”[informally], aka “that show announced in 2012 that no-one’s heard much about since”[socially]), if it does actually go ahead, ensure it’s good. 5 Good is far better than 4 great and one bad, because somehow the bad will overshadow things, and destroy all the reputation of the great, just like a mis-step on the mountain. Especially as there are still markets to conquer, or should that be minds to invade, including here in the US where some British Literature teachers have not heard of Pratchett (and yes, that was basically the response my eldest had on Thursday from her British Lit teacher when she found out). How that can be, I just don’t know, but I’ll be watching. Meanwhile, we (as a family) are still going to continue to listen to Pratchett as before, with the only difference that the cycle won’t grow much larger (alas). I, and my children, are some that will ensure the name of pTerry is spoken for many a decade to come. In fact, from the comments from friends – many of whom I was unaware had even heard of Sir Terry let alone been fans – I doubt he will be forgotten for a long time to come. So while his body may have died, his spirit lives on, And there’s nothing even an Auditor can do about that.